I bought a portable SiriusXM radio to use in my 23-year-old car. After a little use, the antenna began to operate only intermittently, so I called the company to get a replacement. The customer service guy really did his best to help me, but was handicapped by the fact that English is definitely not his first language. I did my best to be patient, but the call took at least twice as long as it should have due to the need for all that repetition of communication. Having received the replacement antenna, I enjoyed that radio – right until the moment when the power adapter became an intermittent performer like the antenna before it. I just went through the telephone drill this morning with a very nice lady at SiriusXM whose English is worse than that of antenna guy and it took four attempts before she understood why I was calling. Every bit of communication took multiple repetitions, including getting her to budge from insisting on charging me for the power adapter that should be a warranty exchange. Later I boarded an airplane bound for a speaking assignment. I fly quite a bit and prefer an aisle seat. Middle seats are often cramped (remind me to tell you about the flight from New York to Chicago compressed between two 350-pounders, one of whom had only a tentative grasp on the concept of personal hygiene), and window seats are often cold. 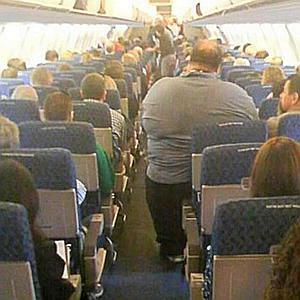 That’s why I prefer aisle seats. Except for when the flight attendants can’t seem to walk the aisle without hips overlapping the seats and they bang into my arm and shoulder on each trip. Going through the Burger King drive-through I was asked by the person on the squawk box how he could help me. At least I think that’s what he said. Once again, a person with only marginal ability to speak and understand English was put in a position where communication with customers was a key job function. I ordered a grilled chicken sandwich and, upon opening my bag, found the sandwich. Along with fries I didn’t want, but for which I apparently paid. Are you making decisions about who gets what job? Think about the likelihood of a person being able to succeed and choose accordingly. Don’t ever put someone in a position to fail. Now, about those two huge guys on that flight from New York . . .
How are the people that are new to our country going to learn to communicate in English, unless they get a chance. We need them to succeed. In fact many of them will succeed because they are doers. As past behavior is the greatest predictor of future performance…their past behavior is amazing. Can you imagine uprooting everything. But we will upset customers…I think communication is key. Maybe having options on the autoattendant that become clear to users. Select a longer wait vs shorter wait, while struggling with language barrier. Large butts are another matter entirely. They weigh done the plane, which scares the c&[email protected] of me.